Taiwanese salt and pepper chicken is the crispiest fried chicken I have ever tasted. It stays crispy even after one hour! The secret? Deep-fried the chicken twice. In this article, I want to share with you how to produce the glass shattering crispiness exterior with the correct frying methods, and the proper way to flour and coat the chicken. This street snack is famous, especially at the Taiwanese night markets. It has a few Chinese names: 咸酥鸡, 盐酥鸡,椒盐鸡块 which all mean the same item. It is translated mainly as Taiwanese salt and pepper chicken or Taiwanese popcorn chicken in English, although I do not know how is it related to popcorns. Let’s get into the detail one by one. You can use either breast or thigh meat (with or without the bone) to prepare the Taiwanese salt and pepper chicken. I prefer thigh over breast meat for its tenderness and texture. Remove the bone of the chicken thigh. Cut away the skin that is dangling on the chicken pieces since they are likely to detach from the meat during frying. Cut the chicken into bite-size pieces, no larger than an inch square. Combine the chicken meat with light soy sauce, ground white pepper, salt, and some chopped garlic. Marinate at least half an hour in the refrigerator to let the flavor penetrate to the interior the chicken pieces. Combine the all-purpose flour, salt, Chinese five-spice powder, baking soda and some water to form a batter. The batter should thick enough to adhere to the chicken. It should not be runny. Drench the marinated chicken pieces in the batter. Next, put some potato starch in a large bowl. Combine the chicken with the starch and make sure they are fully covered by the starch before frying. This step is crucial to let chicken will soak up as much starch as possible to form a dry exterior. 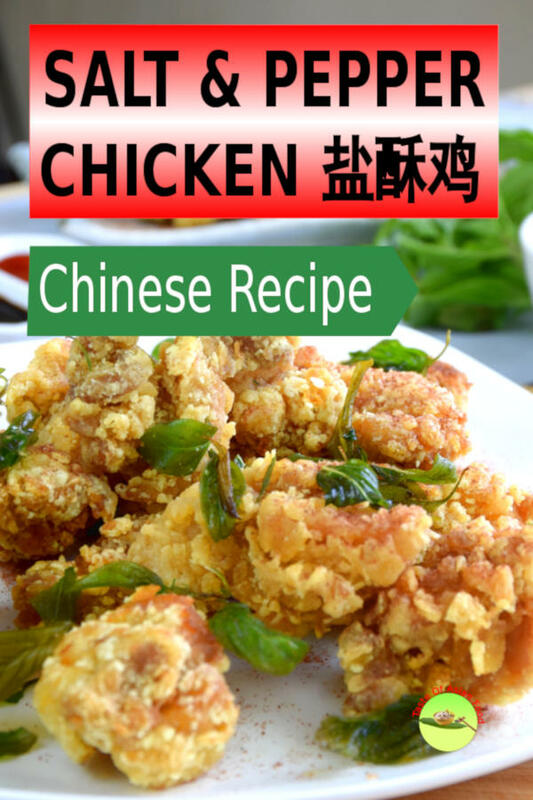 Most of the Chinese salt and pepper chicken recipe suggest using sweet potato starch. 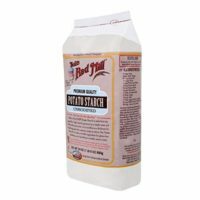 I couldn’t find sweet potato starch after visiting a few grocery shops, so I have decided to test other starches to find out whether these are a suitable alternative. I conducted a simple experiment by using cornstarch, potato starch, and wheat starch to coat the chicken. The result showed that there are very similar between the three types of starches. All of them remain crunchy after one hour. They do look slightly different, and the one with potato starch has the best appearance. I finally settle with potato starch for this recipe. Deep-fry the chicken in a pot of oil at 175°C/350°F until nearly cooked, about 3 minutes. Remove and set aside to let it rests for a few minutes. Deep-fry for the second time at 200°C/390°F until golden brown, about one minute. Double deep fry is the secret step to make it stays crunchy for an hour after deep frying. The following section explains in detail what is happening to the chicken during frying, and the reason behind. Those who are familiar with how to cook French fries will know that double frying is the recommended method to produce the crispy texture. 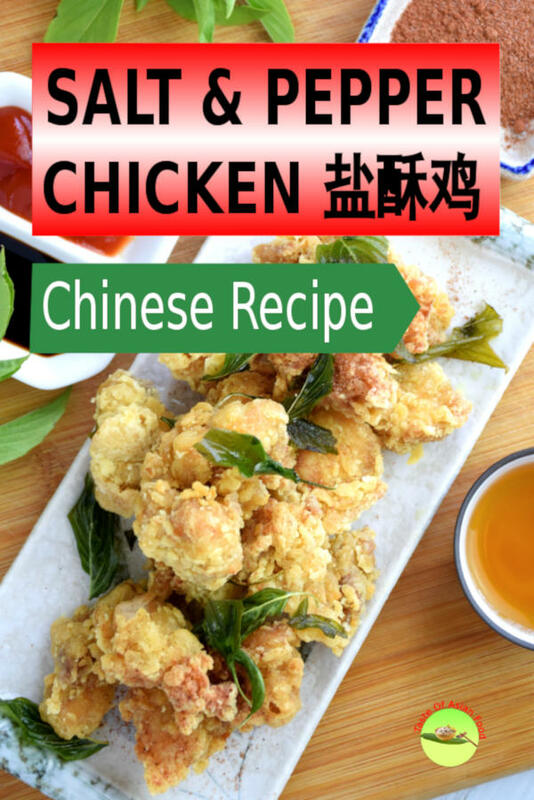 The same method is used to fry the Taiwanese salt and pepper chicken, which stays crispy for an hour after deep frying. How does this accomplish, and what is happening behind the scene? You will notice the chicken pieces sizzle and bubbles are cradling the chicken during the first round of deep-frying. That is because the water in the chicken starts boiling and evaporating. Some people misinterpret that the oil is boiling, which is not. Most of the vegetable oil will only reach the boiling point at 200°C/390°F and above. The first round of frying is way below this temperature, ideally around 175°C/350°F. The lower temperature is used to remove as much water as possible from the surface, and not to brown the chicken since there is another round of frying. Since the goal is to dehydrate the exterior of the chicken, we need to keep the chicken as dry as possible to achieve the maximum effect. That is why we coat the battered chicken with an abundance of potato starch before the first round of frying. The starch will absorb any moisture migrates to the surface from the interior, keep the exterior dry and form a crust to protect the interior from drying out during deep frying. The baking soda in the recipe will release carbon dioxide during frying, causing the flour batter to expand quickly and enable rooms for rapid loss of moisture to form a crispy crust. As a result, a thick crust is build up after the first round of frying. The chicken is nearly cooked and with a fragile coating after the first round of deep-frying. 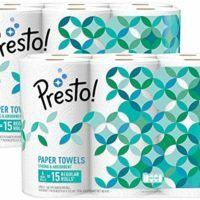 Remove it from the oil and let it rests on paper towels for a few minutes to drain off the oil, creating more opportunities for the moisture to escape. Deep-fried the chicken again at a higher temperature to drive off the remaining water. You will see the internal moisture escaping, and bubbles are streaming out from in interior. The second frying will quickly dry up the outer crust, causing it to form a crisp, glassy crunch layer of coating. Remove the excess oil immediately. The vapor inside the chicken will turn back to water once it starts to cool. The sudden reduction of volume creates a suction force that draws the oil from the exterior into the chicken and making it greasier. This problem can be prevented by putting the chicken on the paper towel and wipe off any excess oil immediately after deep-frying. Mix the salt, white pepper powder, and five-spice powder. Then toast in a pan over low heat until it becomes fragrant. 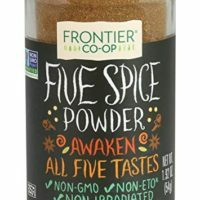 You can also add some chili powder for a spicy version. Sprinkle the seasonings on the fried chicken and serve immediately. Wash and dry the basil leaves thoroughly with kitchen paper towel and deep fried until crispy. The oil will splutter if the leaves are wet. Combine with the chicken and sprinkle the salt and pepper mix, serve. Since the purpose of the first round of deep frying is to dehydrate the exterior, I thought it is possible to coat the chicken with the flour mix alone without water, hoping to get a crisper result. However, the flour mix was unable to form a crust effectively on the surface due to lack of adherence power, as opposed to the batter. The final crust was too thin to protect the chicken, resulting in a dry interior and thin exterior coating. Conclusion: Coat the chicken with dry flour mix is not recommended. This Taiwanese salt and pepper chicken is famous, especially at the Taiwanese night markets. It has a few Chinese names: 咸酥鸡, 盐酥鸡,椒盐鸡块 which all mean the same item. 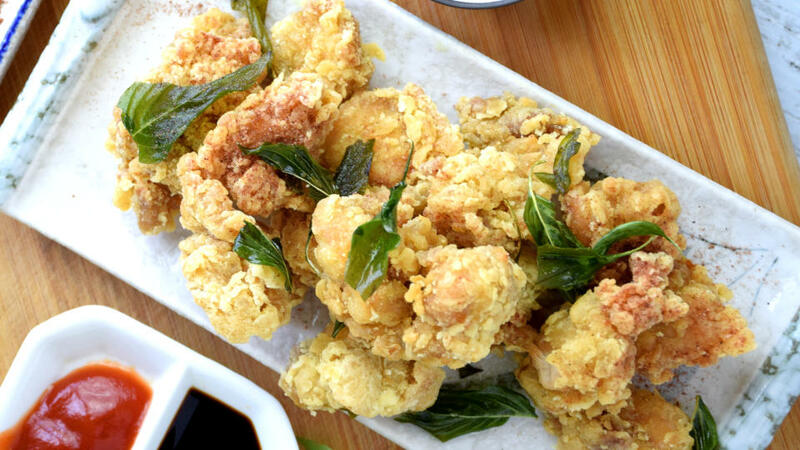 It is translated mainly as Taiwanese salt and pepper chicken or Taiwanese popcorn chicken in English. Remove the bone of the chicken and cut away the skin. Marinate at least half an hour. Combine the all-purpose flour, salt, Chinese five-spice powder, baking soda and some water to form a batter. Coat the chicken with the potato starch. Wash and dry the basil leaves thoroughly with kitchen paper and deep fried until crispy. Mix the salt, white pepper powder, and five-spice powder and toast in a pan over low heat until fragrant. 1 Response to "Taiwanese salt and pepper chicken"